Jason and I certainly are not new to living aboard, but when we lived aboard Chance we didn’t have to report in for work on a daily basis. Boat work was our full time job. It was 24/7 of epoxy and Sunbrella (though, never together). This time around we are working full time jobs AND trying to fit in a long list of boat projects in our spare time. This is proving to be much more difficult that we originally thought. Once we get home, walk the dogs and relax for just a minute it is already after 8pm. The lure of starting an “easy project” always wins, and I find myself up way past my bed time in order to finish it. Projects that we used to get done in a short time seem to take multiple weekends. Day to day life just gets in the way. It’s a constant battle between if I have enough clean socks or if I absolutely need to do a load of laundry. Sigh. 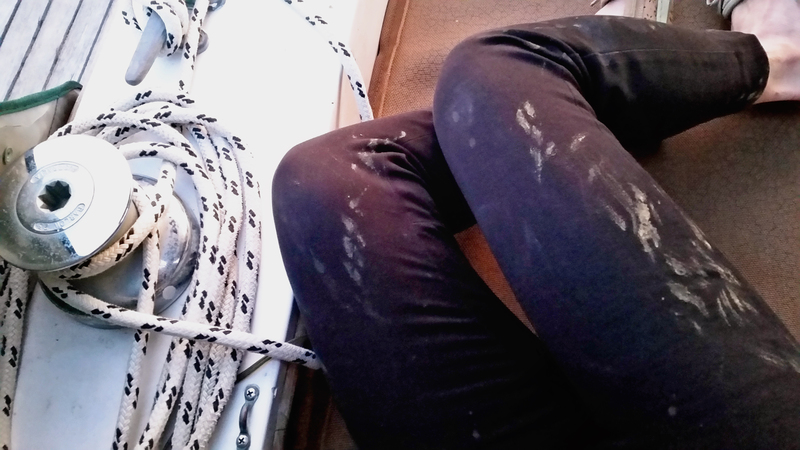 Its hard to remember to change out of my work clothes BEFORE starting boat projects. Another thing that is different this time is that we aren’t just interacting with boating people. Despite NYC being a series of giant islands (Staten Island and Manhattan are its own islands, Brooklyn and Queens are a part of Long Island, The Bronx isn’t an island but it has a lot of water around it), only a very small portion of the residents actually go out on the water. People just get lost in the concrete jungle-ness and really don’t explore much else. In general, people have been really supportive of our peculiar way of living. They think it is “cute” that we hated living back on land and while it may not be for them, they think its cool we’re going against the norm. All the sunset picks and skyline views we’ve been sharing on Instagram aren’t hurting our case either! What are some of the funniest comments you’ve heard from your land loving counterparts? Tell us below! Apparently, your co-workers think you are part of the cast of for the TV series “Vikings”! We always get the question about going to the bathroom too. Why is this so intriguing to people and why do they think it’s so different? And people are always surprised to find we have all the comforts of a home, just much smaller. I guess we are all weird to them! Our personal favourite was when we were moored above the lock flight in Bath. Overlooking the city below, on our canal barge, a passer by asked how we faired in the recent floods… We had to point out that all of that city had to be underwater even the cathedral tower before we’d see any here. This kind of life doesn’t suit everyone. We don’t have to fit in! We’ve heard most of the same questions as you. It’s just unfathomable to people who’ve never been aboard. It’s really fun to screw with people with the various answers. Curious to see how the winter up there manifests itself in boat life. I know people do it, but it will be fun to read about. I’ll be sending warm thoughts your way in a few months! My wife’s coworkers used to bring her real estate listings to convince her she could afford a house. No matter how many times she told them, they could not believe she would choose to live on a boat. Lived aboard in the Seattle area for seven years. At one point I had my boat in an in-water boat show. A young woman of the soccer mom persuasion came aboard and happened to open one of my galley storage cabinets. When she noted the food stored there she turned to me in amazement and said, “You LIVE on board this tiny little thing?” My response: “Lady, people who live in houses are WEIRD!” She freaked out and made a dash for the companionway—-. Thanks for sharing! Just upgraded from a 14 ft daysailer (tired of trailering and rigging/unrigging) to an old 25 ft Catalina in a slip this summer. At 6’4″, my lanky frame is hoping this might just be our training boat. But, I’d like to think we can make some sleeping comfort improvements and slowly graduate from overnights, to long weekends, to a week, to a bigger boat, to more of the same, to (someday/maybe) liveaboard?????? Might be a little cold and snowy in Michigan to give up the house. And thoughts of crossing Lake Michigan, let alone some ocean crossing, aren’t seeming likely….yet. But, I appreciate the encouragement and inspiration that comes from those, like you, who are doing these things, sharing their experiences, and opening new worlds to me and my co-captain. Thank you.